This 1958 Orson Welles’ picture has been called the last of the classic film noir era. We discuss Welles’ approach to filmmaking, his conflicts with the movie studio and the thematic tensions displayed by the genre at the time. Oh, and Charlton Heston’s makeup. That gets a good 10 minutes. Clute S, Edwards R. The Maltese Touch Of Evil : Film Noir And Potential Criticism [e-book]. Hanover, N.H.: Dartmouth; 2011. Available from: eBook Collection (EBSCOhost), Ipswich, MA. Accessed September 3, 2018. 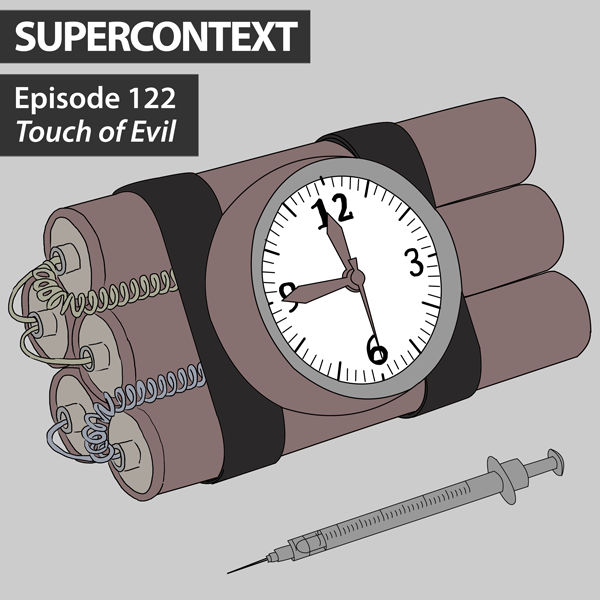 This entry was posted in Supercontext and tagged Badge of Evil, Beatrice Wells, Charlton Heston, episode, film noir, Harry Keller, Janet Leigh, Malene Dietrich, memo cut, Orson Welles, podcast, Russell Metty, Touch of Evil, Universal Pictures, Walter Murch, Whit Masterson, whitewashing on September 14, 2018 by Charlie.